Earlier this week, on Wednesday, we remarked upon the “palpable sense out there that the US dollar is coiled, ready for actionhttp://commentary.omicronforex.com/2014/07/us-gdp-and-payrolls-will-inform-fomc.html” . Everything that has happened in the Foreign Exchange markets since then has added to that understanding. 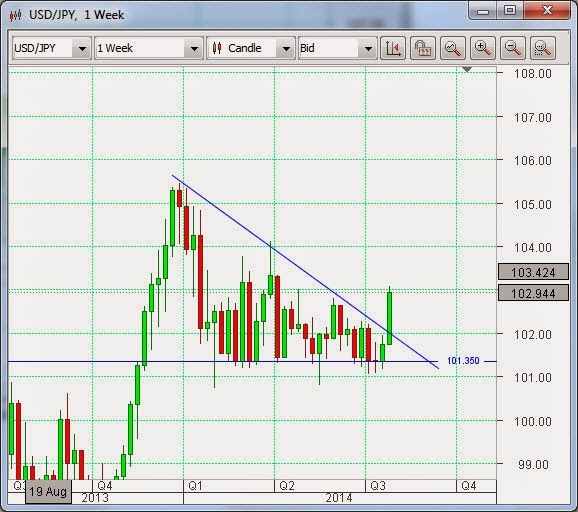 One of the pairs most sensitive to US dollar strength, or the lack thereof, is the USDJPY instrument. It seemed for some time to have been in a well-defined sideways range but, while always accepting that Technical Analysis by the study of chart patterns can be a subjective undertaking, it would now appear that the pattern was a descending triangle, and one from which price might be in the process of breaking out to the upside (see chart above). One problem with this is that a descending triangle is most often thought of as being a bearish signal, although in the case of a rising market prior to its formation, it can be a continuation pattern. In this case we will tend to go with the latter interpretation, especially if the US Non-Farm Payrolls report, due later today, confirms that the US economy is, at long last, coming back to what we would all regard as normality. And given that payrolls will be in focus today it might be appropriate to comment on the linkage between them and currency rates. At the most basic, employment rates that are tending towards full employment can generally be expected to lead to increased wages, due to good, old-fashioned market forces. This in turn causes prices to increase, as companies must get more revenue to remain profitable. So we get inflation. Workers feel the pressure of this, they look for higher wages and a cycle, which can quickly get out of control, starts. Rising inflation leads to increased currency exchange rates in the economy concerned. Coming out of this recession there is, at the present time, no such pressure, at least not yet. In fact in Europe the big fear is deflation, which will cause consumers to postpone the purchase of big-ticket items and thereby delay recovery. So central banks in the developed economies would really like to see higher employment and even some upward pressure on wages. Now the subject that is exercising the minds of many in the Bank of England, the ECB and the Fed is the participation rate. This refers to the proportion of those who are eligible for work but who have given up looking for it. There is a fear that the current relatively low unemployment rates in both the UK and the US are skewed because of this, and that when opportunity picks up these people will come back into the labour market. This is the reason for the talk of slack in the economy that we hear from time to time. There are a number of theories for the relatively high number of people that seem to have opted out of the labour force. It could, indeed, be that individuals are disillusioned. In the UK economists have put it down to more self-employed, and this could be the case stateside as well. However, there is one factor that really could make the situation “different this time”. That is the large number of so-called baby boomers who are now retiring. And whatever pressure they put on pension funds in the western world in the future, it is unlikely that they will be re-entering the labour market.